Hello there friend. How are you? I'm great. Thanks for asking. We had a pretty good week and we were able to capture a few of those moments with our phones. And I thought I should share them with my awesome blogging pals. First we went to the fair. Mrs. Shife and I hate it, but the kids love it. I think the title gives it away, but check out Hayden doing her thing. She figured out the back flips all by herself and then she tried to do 3 of them but just didn't get up high enough. Kyle a.k.a Toothless was happy to close out the fair adventures with a caramel apple. He lost two choppers in the last two weeks and for some reason Hayden got shy. I also feel kind of bad for taking this picture because it looks like we interrupted a photo shoot. 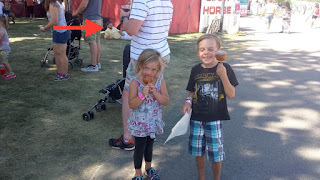 It's hard to see but I put a red arrow in the photo below next to what appears to be a male model getting ready to take some action photos. Sorry Zoolander. I hope we didn't ruin your chances to be Mr. August in the 2017 Men Of The Western Idaho Calendar. Then we started school. Can you guess who was happy about someone going back? Kyle wanted summer to "last forever" and I don't blame him as he had a pretty awesome one. Hayden will definitely miss her brother while he's at school after a few weeks, but she seemed more than OK with the idea that she was going to be home alone with just Mrs. Shife. Finally, Kyle got to practice reading to his new buddy, Oakley. One of our babysitters brought over her dog and Kyle wanted to read to him. It looks like it went OK.
Well that's it. Thanks for stopping by. Have a great weekend and talk soon. Starscream Haley is quite the flipper! Uncle Kenny is mightily impressed. 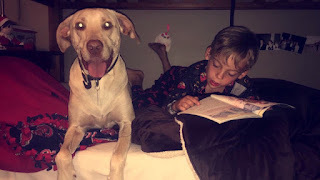 I like that Kyle reads to dogs and orders caramel apples despite having no teeth. This says to me that he attempts the impossible. He'll go far. Next Wednesday around here starts school. who go hither and yon around the neighborhood. I doubt I'd have had the courage to do those backflips at her age. Very brave. If it weren't for the phones, I don't know when I'd ever take pictures. I'll try to add a few more to mine. You're too good about sharing yours. You notice the funniest stuff (in the background). Those bouncy things are awesome. I also hate fairs and thankfully Faith being the introvert that she is, didn't want to go that often. Your daughter is amazing. Is there anything she won't try? I imagine Kyle will soon have a happy look on his face once he gets back into routine, after all you can't keep a good guy down! Back to school time is rough, I don't blame Kyle one bit. Also, I think I lost a tooth or two chomping on caramel apples as a kid. Its one of those things I avoid but cant really remember why. Nice catch on that photobomb. Maybe a modeling agency will see this and give him is big break haha. yeah, back to school is a total bummer for young men in their prime. in june it seems that summer will last forever but october brings candy and december brings toys. My daughters are both leaving to go to college and Uni, boy it's going to be quiet at home, and I can't say I'm looking forward to it. I popped over from Jenny's blog.